It’s always a good idea to be running the latest version of Plesk if possible. As with any software, security loopholes are found and exploited and Plesk are frequently releasing updates to improve the security and other features of the platform. Usually, Plesk will update automatically within each major version. 10.4.4 for example updated seamlessly from 10.4.3. Updating major versions however requires user action. The reason I updated Plesk 10 to Plesk 11 was initiated by an alert from our hosts 1and1 about a server vulnerability for ‘ISC BIND 9’ which deals with various DNS functionality within Plesk. The version I was running was ‘BIND DNS Server 9.4.2’. I figured rather than try to address the problem specifically, upgrading Plesk would be the best option as I would have the latest, most secure version of Plesk in addition to the latest Bind DNS server component. 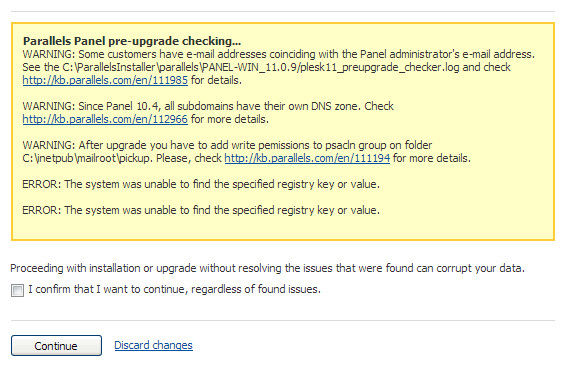 Before I upgraded Plesk, I ran a Windows update via RDP which installed a number of important updates. I don’t think this was necessary, but good practice to keep Windows server updated with latest security patches etc. Once logged into Plesk, select Tools & Settings under Server Management from the main menu. 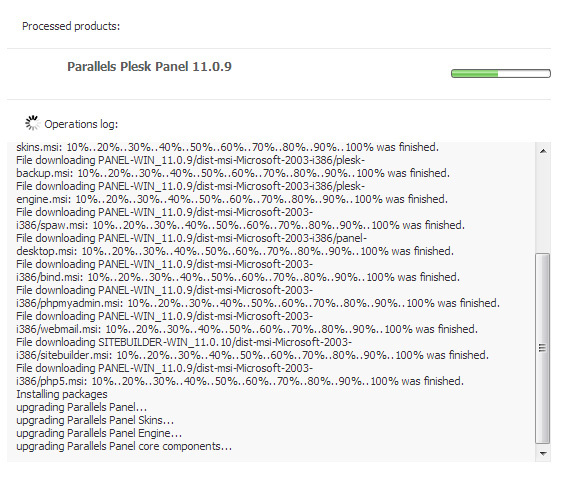 Select Plesk 11.0.9 (latest stable release at the time of writing) and click continue. An installation progress screen will then appear like the one below. With my install, it hung on ‘installing core components’. After leaving it for nearly 2 hours I tried to re-login to Plesk and was greeted with a shiny new Plesk 11 login screen – nothing to worry about in the end and I put the issue down to a bug with the installation screen not refreshing properly.